It's a busy time of the year as we all begin to plan for 2015 and review what happened this year. Odds are, we are either taking this time to 1) explore new mediums, 2) invest more with our leftover budgets - or 3) patting ourselves on the back for saving money and still producing great results. For all of our customers, we hope the third item holds true. It's also a busy time of the year for Survey Analytics and we would like to unfold some of the happenings from September in another edition of our monthly recap. Continue reading to see some newsworthy topics, events we participated in and the latest features available in our software. In September, we were happy to announce the launch of The Handbook of Mobile Market Research by Ray Poynter, Sue York and Navin Williams. We were so excited to receive our copy of his book just last week! In addition, the authors were so kind to provide us with a full chapter of the book on "Designing and Conducting Mobile Research" which you can find below. Ray Poynter is behind an association keeping up on the latest trends in market research called NewMR. The events, broadcasts and webinars are all free to attend. Events, events, events. So many events! To supplement the Handbook of Mobile Market Research, NewMR hosted a virtual launch panel discussion, which was awesome! Check out our recap here. Secondly, the Survey Analytics Marketing Team was in attendance at Hubspot's massive INBOUND 2014 event in Boston. Check out some of the key takeaways (12 to be exact) from a first timer to the event provided by Marketing Coordinator Melissa Ridgley. The third event that happened was the annual AMSRS Conference in Sydney where our Head of Marketing and Sales in the APAC Region, Colin Wong, was in attendance. He even ran into a good friend of ours, Betty Adamou, the CEO and Founder of Research Through Gaming! We are happy to announce that during the month of September that one of our customers came forward to collaborate in the development of a new feature and we made a case study about it. The first case study is a story about Enterprise Development Group, an innovation assessment and consulting startup based out of Palo Alto, California. With the help of our affiliate company IdeaScale, we were able to develop a new feature called "The Recommendation Engine" and launch The Innovation Fitness Survey. This survey used some of our logic and a scoring system to provide instant, targeted feedback to respondents based on their survey input. deliver Stay tuned for more details on how The Recommendation Engine works in a Feature Spotlight post coming soon. 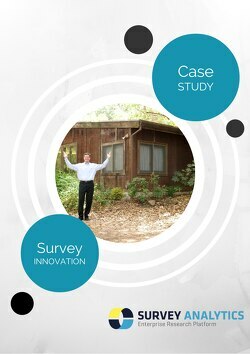 For now, you can check out the case study here. Survey Analytics version 5.5 was released on September 5, 2014. First, we enhanced our heatmap analysis question type to enable respondents to select multiple areas of an image that grab their attention. Another really cool feature in Survey Analytics 5.5 is that we added some new question types to manage logic and skip branching patterns. The question types you can now use this logic on include date/time, open ended numeric input, open ended comments, rank order and the side by side matrix. Learn more about the features in Survey Analytics 5.5 here. A new discussion feature in panel called Qualstorm that enables you to have live, archived chats in your community. Think online focus group 2.0 - because it's more interactive. There's even a whiteboard. Also with this release came an awesome new featured called "Hotspotting" which enables multiple areas of an image to be selected during a survey. This is an improvement upon the popularly used heatmap analysis question type, which has been a part of our survey software for quite some time. Now you can segment survey results by question types in just a couple of clicks! The question types you can now segment results on include date/time, open ended numeric input, open ended comments, rank order and the side by side matrix. The Survey Analytics Development Team worked really hard this past month to make sure things were smooth for the launch of iOS 8. Last Friday they took some time to breathe and have a team building afternoon followed by some delicious food. Their team building activity, "Comment Upon a Friend" encouraged the team to write line items and their name next to something awesome about everyone they work with. Learn more about their team building activity and see more great photos here. Good times and good vibes ahead leave us to conclude the month of September with big smiles on our face. As always, be sure to check out some of our past monthly recaps while you're here.